Alopecia is the medical word for hair loss. Healthy hair grows in a cycle, and, it is normal to lose hair and grow it back during this cycle. You lose, you grow, you lose, you grow... The average non alopecic human head has about 100,000 to 150,000 hairs. 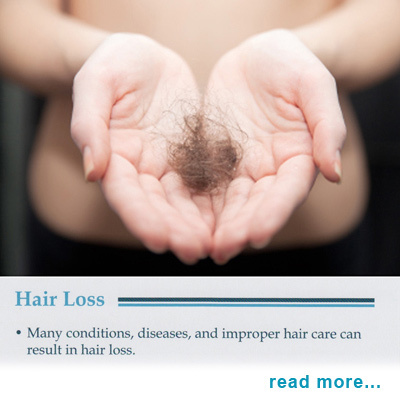 Unfortunately, hair loss becomes a problem when you lose more than you grow back. First, is anagen, the growing phase. In anagen, your hair grows and grows and grows. Then, in catagen it rests. In Telogen, it sheds, and then goes back to anagen. Out of 100,000 to 150,000, it is normal to lose 50 - 100 hairs per day. 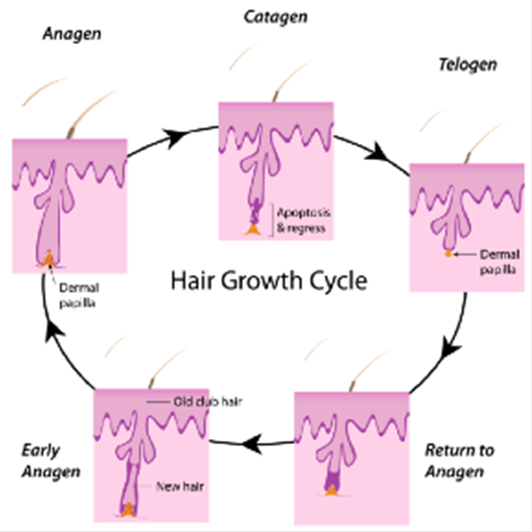 So, some hair loss is just part of a natural cycle of hair growth. We normally lose about 100 hairs a day, but new ones grow back to replace them. The reasons for hair loss can vary from genetics and aging to stress and diseases. 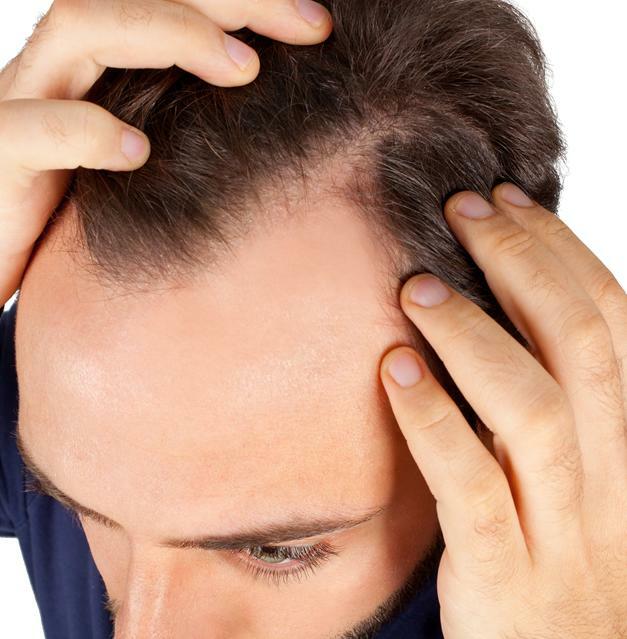 Hair loss naturally happens with aging, and is slightly more common in men than women. In addition to these, hair loss can also happen as a result of a major surgery, an acute bout of stress, or childbirth. It can also be due to underlying diseases, such as lupus and diabetes, hormone problems, or the use of certain medications. 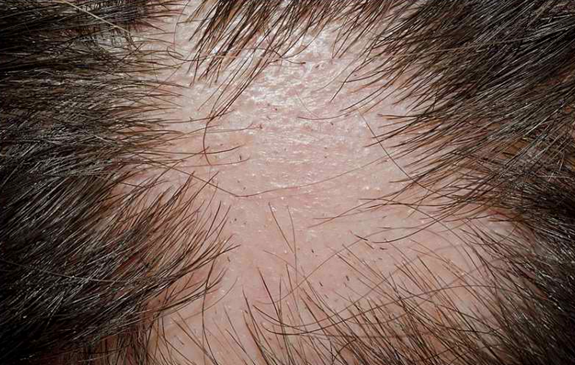 Male pattern baldness (androgenetic alopecia) is related to hormones and genetics and is usually a receding hairline with hair loss at the front near the forehead. androgenetic alopecia affects about 80 per cent of men by age 70. Dr. Jacobs may want to discuss Rogaine solution and/ or Propecia. Male baldness is better prevented than treated. Once the hair follicles are dead, they are dead. In many cases, it is possible to prevent this death. Thus, prevention is especially important for boys who have a strong genetic link to balding. 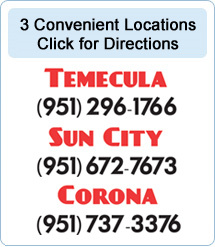 (Mother’s father is bald) Please bring them in to see Dr. Jacobs to talk about prevention. Female pattern baldness (androgenetic alopecia) typically consists of thinning hair on top of the scalp. Just as males can lose hair, so can women.About 40 per cent of women show signs of androgenetic hair loss by age 50. 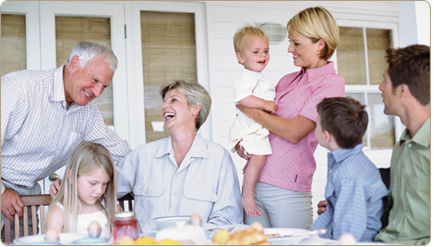 Genetics are involved as are hormones, such as lower estrogen levels at menopause. 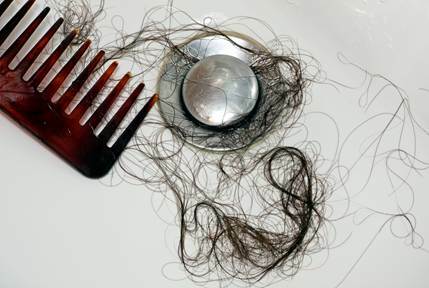 Many women with hair loss have normal levels of testosterone. Most women with androgenetic alopecia should have their hormones checked. Dr. Jacobs may want to discuss Rogaine solution and hormonal therapy. Alopecia areata results in round bald patches (although other patterns are possible) that candevelop anywhere. 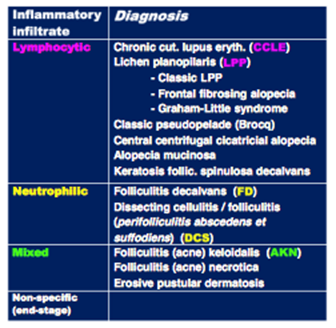 Alopecia areata is actually an autoimmune disease that often begins in childhood and affects people of all ages. 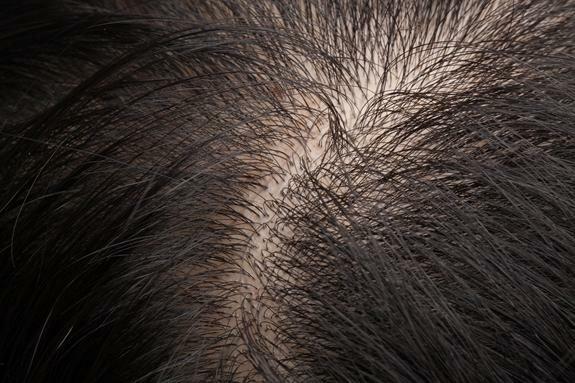 Alopecia totalis is when all scalp hair is lost, resulting in complete baldness. Alopecia universalis is when all body hair is lost. 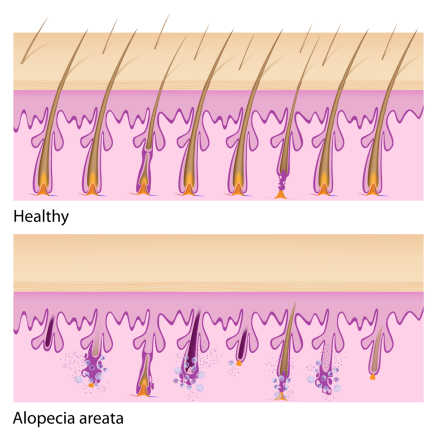 In alopecia areata, the affected hair follicles are mistakenly attacked by a person's own immune system (white blood cells), resulting in the arrest of the hair growth stage. Alopecia areata occurs in males and females of all ages and races, and can be psychologically devastating. Although not life-threatening, alopecia areata is most certainly life-altering, and its sudden onset, recurrent episodes, and unpredictable course have a profound psychological impact on the lives of those disrupted by this disease. Heredity sometimes plays a role. In one out of five persons with alopecia areata, someone else in the family has also had it. Alopecia areata often occurs in families whose members have had asthma, hay fever, atopic eczema, or other autoimmune conditions such as thyroid disease, vitiligo, early-onset diabetes, rheumatoid arthritis, lupus erythematosus, pernicious anemia, or Addison's disease. Trichotillonmania is hair loss caused by compulsive twisting and twirling of hair, which results in patchy hair breakage. Hair loss may seem like a cosmetic issue but it can have negative emotional effects. Male pattern hair loss, for example, can be associated with low self esteem, depression and social isolation. Women are more adversely affected by hair loss than men. · After recovery from the initial injury or inflammation, there is little hair left. · Scarring alopecia can be diagnosed with a simple 3 to 4 mm punch biopsy. Also, a fungal culture and bacterial culture can be taken. Lymphocytic: Scarring alopecias that involve mostly lymphocyte inflammation of hair follicles, such as lichen planopilaris and pseudopelade, are usually treated with corticosteroid injections into the skin, topical creams , and/or Pioglitazone (Actos®) 15mg / day. In addition, antimalarial and isotretinoin medsmay be used. Neutrophillic: For scarring alopecias with inflammation of mostly neutrophils or a mixture of cells, the usual treatment involves antibiotics and isotretinoin. Drugs like methotrexate, tacrolimus, cyclosporin, and thalidomide have also been used. Mixed: May respond to all of the above. Certainly, cultures should be taken, and antibiotics should be used. Scarring alopecia almost always burns out on its own. The bald patches stop expanding and any inflammation, itching, burning, and pain goes away. 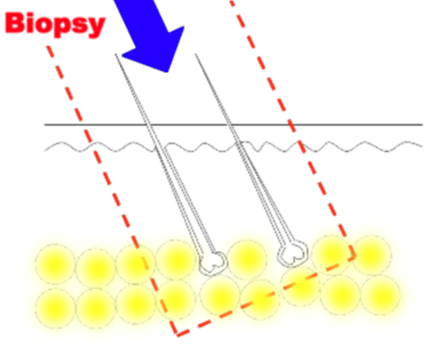 In the end, another skin biopsy usually shows no inflammation around hair follicles. 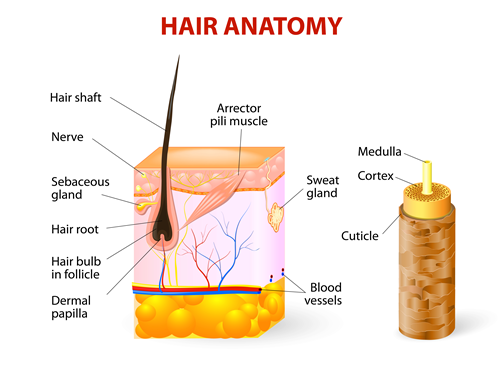 Bald areas usually have no hair follicles. Sometimes, though, hair follicles, at least those at the periphery of a bald patch, are not completely destroyed and can regrow, but often all that is left are just a few scars deep in the skin to show where the hair follicles once were. Genetic: Any history of female or male pattern balding in the family. Any type of familial hair loss is important. Stress: Any history of significant life stressors in the last two years, such as: Deaths in the family, divorce, auto accident, major surgeries, weight loss, crash diets, emotional trauma, inadequate nutrition. Medical: Any history of lupus, AIDS, syphilis, scalp conditions, anemias, seborhea, psoriasis, nervousness, diabetes, depression, hormonal problems, menopause, unwanted hair growth in women, alopecia aereata, thyroid disorders, autoimmune diseases, etc.